Just because you are on two wheels as opposed to four does not mean you cannot be entitled to expect the same premium quality of sound you have come to expect. 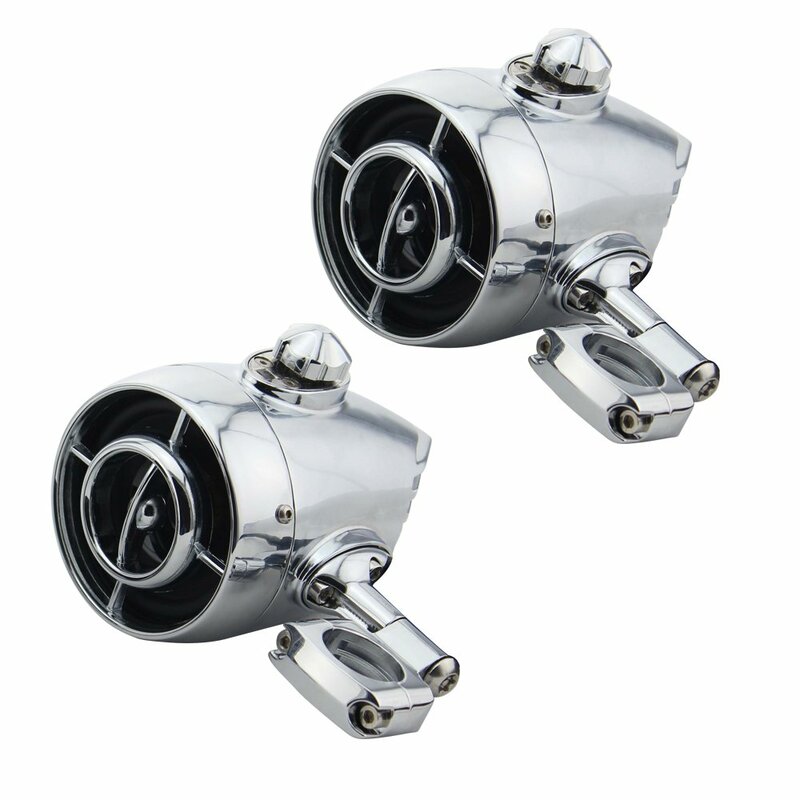 There are a variety of options when it comes to motorcycle handlebar speakers. We’ve already talked about bluetooth speakers in another post – these are quite similar, except they’re specifically designed to mount on your motorcycle’s handlebars. Best motorcycle handlebar speakers: which are they? 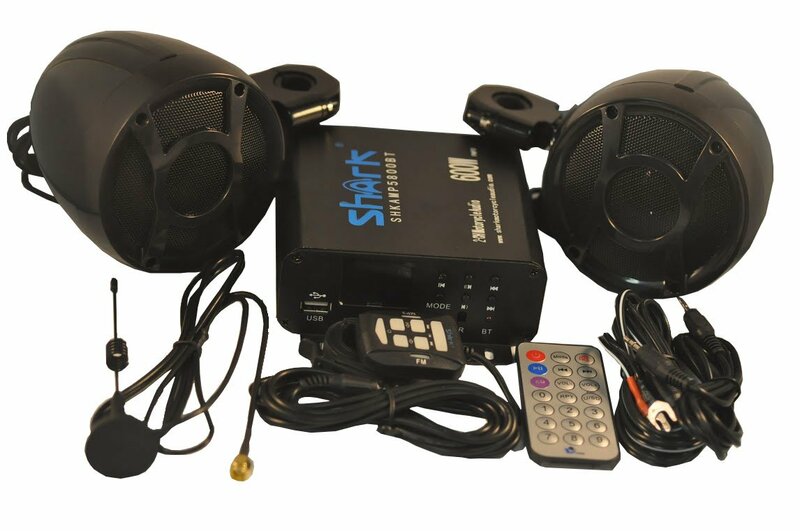 Beginning our look at the best motorcycle speakers with this excellent system from Shark. They are a name which has become synonymous with top quality biking audio and this model is no exception. They come fully loaded with everything you need to provide the best quality biking audio experience possible. Featuring a pair of three inch speakers which fit comfortably on the included handlebar brackets to produce an impressive 600 Watts of power output. These speakers are highly waterproof and can withstand any number of inclement weather conditions. It is this rugged quality which makes them ideal for a regular rider who often ventures off the beaten track.In terms of connectivity, the shark connects to your tunes via Bluetooth, Aux Input, SD input or USB. You can use an mp3 player, CD player, phone, SD card, or USB device. You can also connect a Sirius tuner. This vast array of options mean that regardless of your environment and surroundings, there should always be an available method for you to play your music. This model also comes with a very handy remote control. This means you can easily switch between functions and channels on the pre-installed FM radio, while stationary. 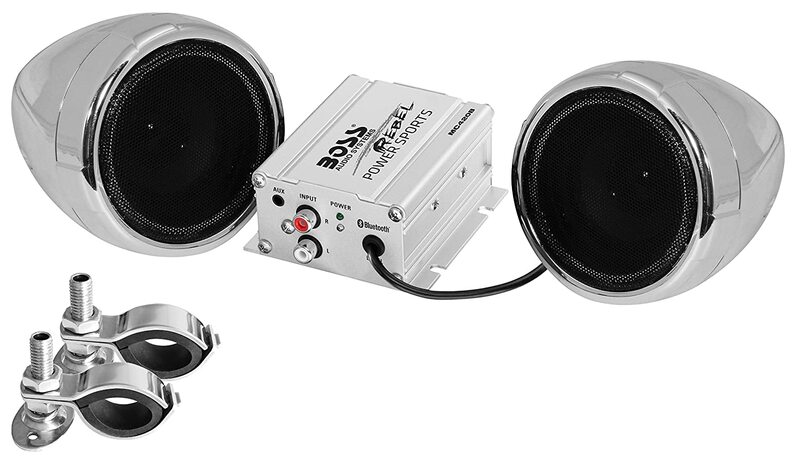 Next up in our review of the best motorcycle handlebar speakers are the BOSS MC420B speakers. From the outset, these certainly catch the eye with their silver casings. This works well for bikers who want to color code along with other accessories and go for a sharp modern style design.This system also comes in a black color with the option of being Bluetooth enabled or not. Personally, the Bluetooth feature is very useful since it enables you to connect with a variety of devices without using any awkward cabling. 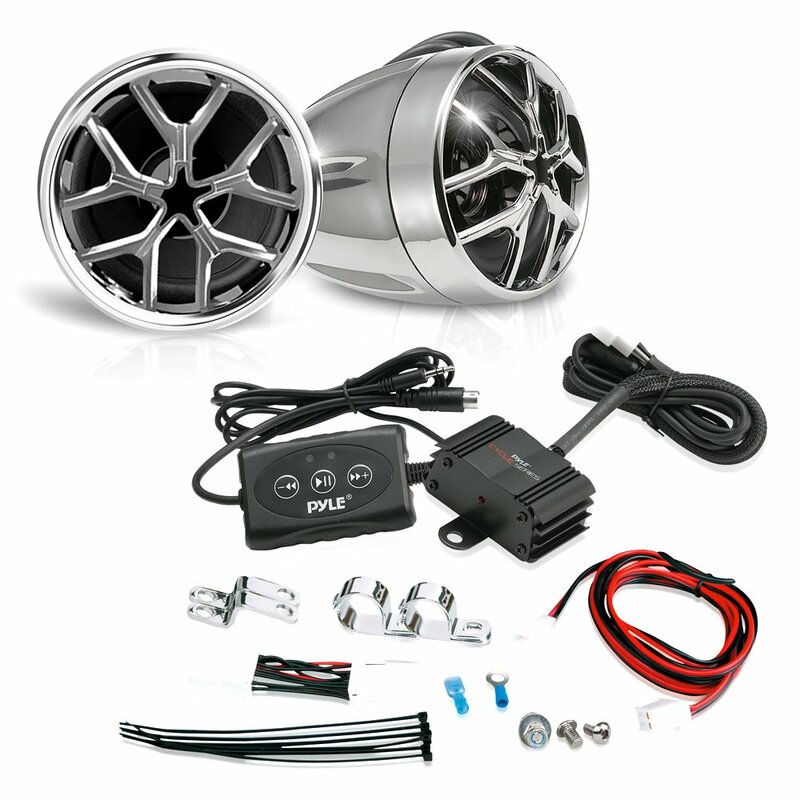 The model also comes with two, 3inch speakers as standard, producing a powerful 600watt output together with the accompanying amplifier.Mounting hardware is also included to help with the ease of set up and the model features a wired remote control allowing for easy changing of output on the move. From a connectivity standpoint, as well as being Bluetooth enabled, the model is also connectable via the Aux cable.The model is weather resistant to a variety of elements such as water splashes and foggy conditions, it is therefore very suitable not only for your motorcycle but also ATVs and even scooters. Next up in our review of the best motorcycle handlebar speakers is the Ohmotor fully waterproof speakers. Like many of the other speakers we have reviewed, this model is designed to withstand a multitude of difficult weather conditions, rain included. Its durability is a great advantage for those who like to ride in all seasons but still want to enjoy listening to their favorite music on the road.It comes in a variety of colors and can easily attach to your handlebars thanks to the pre-attached connectors on either side. With two speakers attached to a central console which feature the touch button controls, this one piece model is very conveniently fitted and also produces a high level of good quality sound. This is thanks to the centralized position of the entire unit.The model comes with a built in FM radio as well as the ability to connect you your mobile devices using both wired and wireless means, through AUX cable or Bluetooth. This allows for instant connectivity wherever you decide to venture. Reverting back to a two-speaker model for our next review of the best motorcycle handlebar speakers. Here we have the Lexin Bluetooth speakers. This is a model which again comes in eye-catching chrome casing to make you back stand out as even more cutting edge. These feature the latest in wireless technology and are controllable from up to 10 meters away with the included wireless remote control. This is excellent if you want to stop and enjoy some scenic views on the road and include some of your favorite music as a backdrop. They are bullet shaped, this makes them very aerodynamic and means they can function very well up to high speeds of 80mph. Producing up to 800 watts of power output means that they are also one of the strongest sound performers on the market. In terms of connectivity, besides Bluetooth pairing, they are easily connectable by AUX cable to any of your smart devices. Next up in our review guide of the best motorcycle handlebar speakers comes from Pyle in the shape of their PLMCA51BT model. These speakers are again totally resistant to all things which the weather can throw at them. This high level of protection means you can trust they will remain fully functional throughout all types of journey. The pair of speakers come complete with a mini amplifier which helps to produce up to 1400W of output, making them more powerful than most other handlebar speakers on the market. They are fully Bluetooth compatible making for easy connection to all devices including Apple and Android smartphones. The speakers are also easily connectible via 3.5mm AUX cable and come complete with a one year warranty. This showcases the companies trust in the product quality. They are very conveniently mounted and come complete with the full range of accessories for doing so. Their sound quality is also top quality, even when faced with adverse weather conditions. Lastly, to round off our review of the best motorcycle handlebar speakers is the impressive and great value for money model from Innoglow. These speakers come in a pair. Again with their bold chrome casing, ensure that your bike becomes even more of a head turner. They are both shock-proof and waterproof. This makes them the ideal companion for hitting the often unpredictable open roads or even trail biking. The model connects easily via the accompanying AUX cable to all of your most commonly used devices. They project a strong quality of sound considering their price range and come with a handy central control console for you to easily change songs and channels. The LED display featured on the control unit is also a neat and very helpful visual feature. This allows you to keep maximum attention on the road ahead while also being able to control the music easily. The auto memory feature is also very useful in saving all of your favorite channels. This model is excellent as a first purchase for those who want to try out a great value but well-performing handlebar speaker. The MC720 BOSS Audio speakers are reliable, have bluetooth connectivity and Spotify compatibility, mount on your handlebars, and don’t break the bank. The two speakers are fed audio through a powerful weatherproof amplifier. There’s also an AUX plug that you can connect your phone or iPod to directly. Size of the speakers is a 4 inch diameter. In the box, you’ll get two speakers, an amplifier, a volume control, and adjustable brackets for mounting the speakers onto your handlebars. The brackets will fit handlebars that have a diameter of 3/4 an inch to 1 1/4 of an inch which should cover a large selection of handlebars. Remember to measure before you buy! Finally, there is a 3 year warranty on the product, which means your dollar will go a long way. All in all this is a great deal. We’ve saved one of the best for last. The Kicker 40PSM34 speakers are one of the loudest speakers on our list. You can attach them to motorcycles, ATVs, and any other handlebars. The speakers themselves look gorgeous with their shiny chrome finishing and durable construction. The mounts are built onto the speakers, which is nice, since it looks more like a single unit rather than having two separate pieces for mounting. The Kicker speakers are very loud in themselves but they’ll do even better with an external amplifier. Actually, this is one of the only downsides to this model. It does not come with an amplifier and the price is quite high considering there is no amplifier. 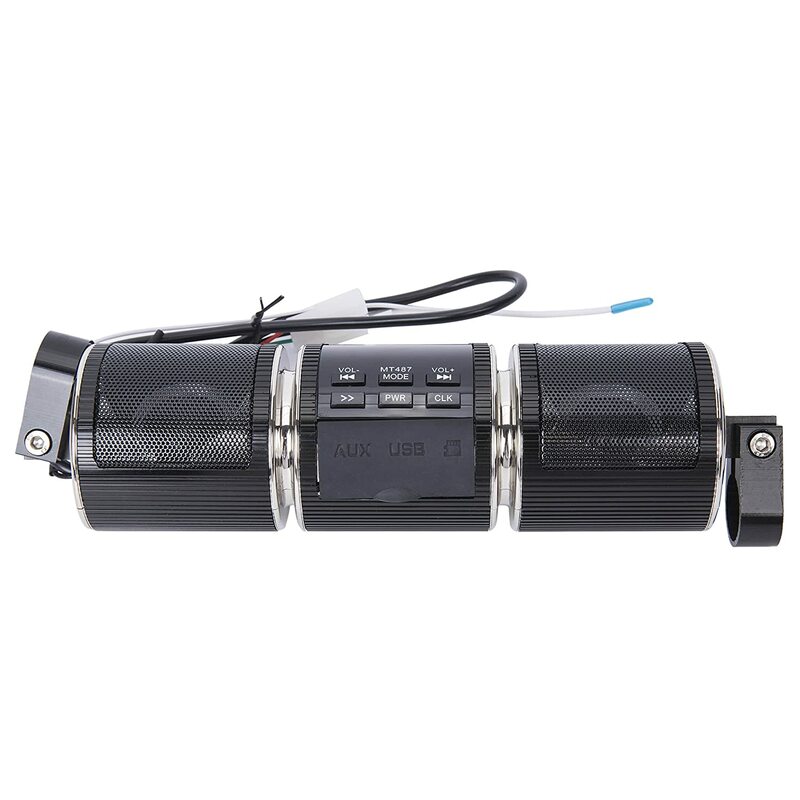 The basic ingredient for a long lasting motorcycle speaker is the material used for making it. High quality and durable materials like metal will make sure that your speakers will be able to handle the harsh winds and weather that your motorcycle is exposed to during riding. Metal speakers are made either from aluminum or steel, and finished with chrome. Aluminum is a very light weight and strong material, and stainless steel is also very cheap but a bit heavier than aluminum. Both go really well with the chrome finishing and look like a part of your bike when viewed. I believe some are also made from PVC – which is a super lightweight plastic – but PVC is not my ideal choice because it will eventually degrade in the sun unless they’re coated or painted over. However, if weight is your biggest concern then PVC is a good way to go. At the end of the day the deciding factor in terms of materials should be durability vs weight – and that will help you choose which speaker you use. Mounting your speakers is very crucial because you have to mount them in a way that does not get in the way of any of the other controls or dashboard components. Most motorbikes have nice and long handlebars so finding a few inches to mount your speakers should not be such a big deal. However, it’s always a good idea to double check the mounting accessories your speakers ship with so you’re sure you will be able to mount them without any issues. Most speakers range from 2 inches to 4 inches in diameter, so you also need to measure the empty space on your handlebar to make sure you can fit the speakers. Mounts are usually clips that adjust from 3/4″ up to 1 1/2″ in diameter. This covers the diameters of most motorcycle handlebars, but it’s always better to double check. 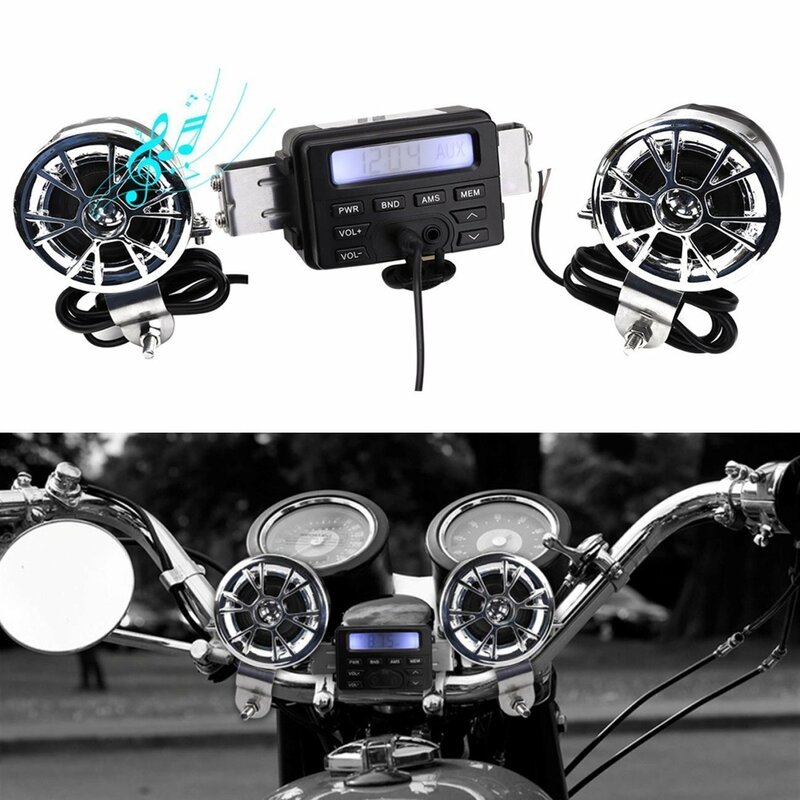 Loudness(volume) and sound quality is a crucial consideration when you’re buying motorcycle handlebar mounted speakers. Unlike helmet speakers where a lot of the outside sounds are muffled due to the helmet, handlebar speakers will be exposed to the elements. You’ll need to be able to hear them over the roar of your bike’s engine, the sound of other cars on the road, and the sound of the wind blowing past the speakers at 60 mph! Check the power of the speakers and if there is an amplifier included or not. Amplifiers help in really increasing the volume – if there is no amplifier then the volume will be a lot less. There are two basic ways to connect speakers to your audio player(usually it will be your phone since most of us have all of our music on our phones, now). You can either connect with an AUX cable, which is like the headphone cable, which goes from your phone’s headphone jack into the corresponding jack on the speakers. Or you can connect using bluetooth, which is wireless. This may be a better option since you can keep the phone protected in your pocket and there’s nothing physical connecting your phone to your bike. Some speaker amplifiers also have radio tuners built in – others also have capability to hook up to satellite radio. I suppose the biggest “other consideration” would be price! Of course you don’t want to break the bank, but you don’t want to get something overly cheap, either. Buy cheap, buy twice, as they say. There are lots of good mid-range options that are durable, have good sound quality, and won’t break the bank. We’ve not chosen any overly cheap models here for the reason above. If you’ve gone through our list of 9 best motorcycle speakers you’ll see that the speakers we like and have chosen are all either mid-range or high-range so you’ll find something that definitely fits your budget. There are any number of selections you can make when choosing which handlebar speaker to incorporate onto your ride. The key features are present in many of the models. Often your choice may come down to factor of value and sound quality. This will be dependent on what type of riding you do and the type of music you enjoy. Luckily, each featured model represents a wide cross-section of the market. You should be able to find a model in this piece to suit your specific needs. Whilst you are here, be sure to also check out our other articles. Helping you make the best accessory choices on every ride.